Preheat the oven to 175°C/350°F. Season salmon with salt and pepper. Then, in a frying pan, sear salmon in some vegetable oil over medium-high heat for approx. 1 - 2 min. per side. Transfer to oven and bake at 175°C/350°F for approx. 10 min. In the meantime, halve cherry tomatoes. In a large bowl, season tomatoes with olive oil, salt, pepper, and lemon juice. Mix together tomatoes and baby leaf lettuce and transfer to a bowl for serving. 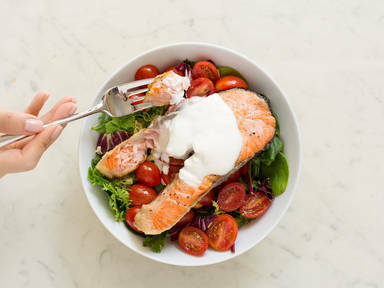 Place salmon steak on top of salad. Top everything off with some yogurt and enjoy!